IRELAND manager Martin O'Neill believes Lionel Messi has failed to take responsibility for his own performances at the World Cup, as the post-mortem of Argentina's 3-0 defeat against Croatia on Thursday night continues. Barcelona's talisman Messi has wilted under the pressure of playing for his country over the course of the last decade, but that demise has never been so vivid as it has been in Russia this summer, with Argentina on the brink of an exit at the group stages after their hammering against the Croats. 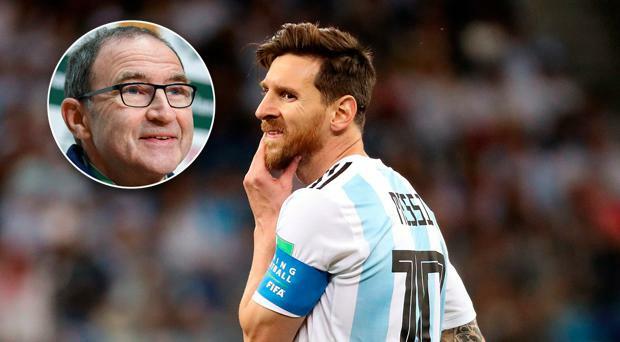 Now O'Neill has given his verdict on Messi, as he suggested he is trying too hard to prove himself on the biggest stage of them all. "This is the closest I'm going to get to criticising Messi, the best player I've ever seen, I think," O'Neill told ITV Sport. "He has to find space for himself. This idea that other players have to find space for him…he knows how to find space. He has been doing it for years. He is a fantastic player. "There is something about him at this moment that is not quite right. Whether it is the weight of expectation on his shoulders, I don't know. "I'm the first to say he doesn't have to win the World Cup to prove that he is one of the greatest players who has ever played the game, but he is playing at this moment like that is a concern for him. "You would not be surprised that Croatia won this game, but the manner of the result was a surprise. This was a capitulation from Argentina. You do not expect that." Meanwhile, Roy Keane have a typically brutal assessment of Argentina keeper Willy Caballero, who was at fault for Croatia's opening goal after his howling error allowed Ante Rebic to score the vital opening goal of the game. "He is supposed to be in the team because he is good with his feet…well he didn't look very good there," stated Ireland assistant manager Keane as he assessed the mistake from the Chelsea keeper. "He was just trying to chip it up and if a keeper did that in a training game you'd be annoyed at him. It is great when they get punished for something like that as well. It was great technique to score the goal and Argentina seemed to lose belief after that goal."